Deconvolution is a mathematical operation used in Image Restoration to recover an image that is degraded by a process than can be described with a Convolution. 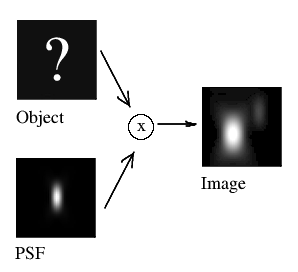 Our aim is to recover the original object "f", and we do it by Doing Deconvolution. See more details on how the Huygens Software does deconvolution in Huygens Deconvolution. Are you interested in testing the new version of the Huygens software with all its available options? Do not hesitate to download Huygens and request a test license.